- Dr. W.PT. James, Aberdeen, Scotland, U.K.
European Journal of Clinical Nutrition is published by Macmillan Press Ltd. Scope European Journal of Clinical Nutrition is published monthly. It aims to cover theoretical aspects of nutrition, relations of function to nutritional status; nutritional causes and effects of disease; the epidemiology of disease; community nutrition and education; the determinants of eating behaviour. Papers on animal nutrition will not be accepted unless they include parallel studies on human subjects. This journal is covered by Current Contents, Excerpta Medica, Index Medicus, BIOSIS and Nutrition Research Newsletter. Ethics of investigation on human subjects Authors must state in the text of their paper the steps which they have taken to conform with accepted procedures for the maintenance of clinical standards. Consent must be obtained from each patient or subject after full explanation of the purpose, nature and risks of all procedures used. The fact that such consent has been given should be recorded in the paper. If an Ethical Committee is in operation in the institution where the work was done, it should be stated in the paper that the protocol has been approved by that Committee. If no such Committee exists, this fact should also be stated in the paper. The Editors have the right and the duty not to accept papers if, in their opinion, the ethical aspects are open to doubt. Subscriptions Subscription price per annum (one volume, twelve issues); EC �175; rest of the world �222 (Airmail), �185 (Surface mail) or equivalent in any other currency. Orders must be accompanied by remittance. Cheques should be made payable to Macmillan Journals Subscriptions Ltd and sent to: The Subscription Department, Macmillan Press Ltd. Houndmills, Basingstoke, Hampshire RG21 2XS, UK. Where appropriate, subscribers may make payments into UK Post Office Giro Account No. 519 2455. Full details must accompany the payment. Subscribers from EC territories should add sales tax at the local rate. European Journal of Clinical Nutrition (ISSN 0954-3007) is published monthly by Macmillan Press Ltd. c/o Mercury Airfreight International Ltd. 2323 Randolph Avenue, Avenel, NJ 07001, USA. Subscription price for institutions is $222 per annum. 2nd class postage is paid at Rahway NJ. Postmaster: send address corrections to Macmillan Press Ltd. c/o Mercury Airfreight International Ltd. 2323 Randolph Avenue, Avenel, NJ 07001. Reprints of any article in this journal are available from Scientific and Medical Division, Macmillan Press Ltd. Houndmills, Basingstoke, Hampshire RG21 2XS, UK. 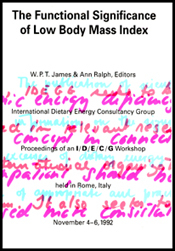 The Journal is the Official Journal of the Federation of European Nutrition Societies (FENS). Do population groups in developing countries in the tropics have lower BMRs?